Julie Klassen's Regency era romance sings with strong research and beautifully crafted characters. Her vivid descriptions brought the time period to life. Lilly won my heart with her thoughtfulness toward her father, brother, and friends. She faced disappointments and hard times with self-denial and courage. Her faith was portrayed in a matter-of-fact manner rather than in a heavy-handed way. She yearns for travel and adventure. A desire for answers to mysterious events and a longing for love, makes the grass look greener beyond the borders of her village. When the opportunity to spend time in London with her aunt and uncle, she jumps at it. Lilly soon learns everything is not as rosy as it appears. 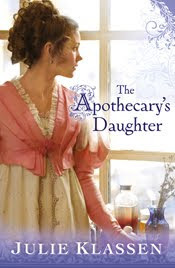 Fans of historical fiction will find, "The Apothecary's Daughter," a satisfying read. I need to go back and read Julie's debut novel, "The Lady of Milkweed Manor." I don't want to miss any of Julie's books. Sounds like a wonderful read, Susan. Thanks for the review. I love Regency, but haven't read any of Klassen's work. Thanks for the review. I definitely need to put it in my TBR pile. Susan: I've heard of this book; thanks for your excellent review of it. How do you fit so much reading into your days? You must be a fast reader! I think Julie's cover for Apothecary's Daughter is so pretty. Just the cover alone makes me want to read the book and tend not to read historical romance. Thank you, Susan, for showcasing this novel. I enjoyed it. Julie knows how to write an appealing romance. When I get through my current stack of books, I want to get her book, "Lady of Milkweed Manor." I agree with you about the cover. The colors are beautiful, and she looks so romantic. They did a great job. I carry the book with me almost everywhere. When I have a few minutes, I pull it out. Of course, it can be frustrating when I have to put it down. I also try to read an hour before I go to sleep. It helps relax me and distract my mind from the cares of the day. I think you'd really like her books. I'll certainly pick up her future titles. BTW, I go to your blog every day, but can't comment. When you changed your design, you went to the comment format I can't use. Any chance you could switch back to the pop-up window? Thanks for the review. This is one book I've been wanting to read. Now I want to read it even more:) Blessings! If you love historical romance, this is a great choice. Both the hero and the heroine are endearing. Hey Susan! Thanks for letting me know about the comment section not working for you. I will see if I can change that! This sounds like a great one to read. Thanks, Susan, for spotlighting it!